Let me just go ahead and share that I was late to the YA game. I didn't really start reading young adult fiction until 2013 and I missed out on a lot of great books, it seems. This year has turned into the year of checking out books that I missed in the years before I got into the genre. So far I've caught up on the Grisha, Nevermore, and Shatter Me series, and Daughter of Smoke and Bone was another that I was dying to add to the list! I wasn't really sure what I was getting into with this one, but I knew that the synopsis sounded pretty original and the cover was beautiful, and that was enough! Karou is a girl who has had a very unusual life. She has been raised by chimera - various human and animal hybrids - who live in a shop that opens to portals around the world. Although her childhood has been very different from that of most of humanity, Karou is happy and loves her strange family. When the story begins, Karou is living in Prague and attending an art school. She has friends and an annoying ex-boyfriend and a feeling that there is something more, but she isn't sure what it is. I like Karou, although I wasn't positive I would from the beginning. She was intelligent and talented, even if she did have a little bit of help from magic. I loved how unusual she was and I also loved her determination and devotion to those she cared about. Akiva is an angel, one of many who is at constant war with the chimera. He has had a rough life and is surprised to find himself attracted to Karou when she should be his enemy. He wouldn't have even been in her world, if he hadn't been working towards fulfilling a mission, but it seemed like fate somehow. My feelings toward Akiva and the romance between him and Karou was... neutral. I didn't necessarily dislike Akiva, I just didn't feel like I had enough information about him to form a real opinion. The good news is, there was no love triangle in Daughter of Smoke and Bone! The bad news is, there was some substantial insta-love between Karou and Akiva. They literally went from not knowing each other to basically in love in a matter of a couple days. There is an attempt made to explain why insta-love makes sense, but it never really sits quite right with me. I just wish there had been more time between them for their feelings to make more sense. Many other characters make appearances in this book and most of them were amazing! I really enjoyed Brimstone and Zuzana, but Brimstone was my favorite by far! Although he was often gruff and even rude, it was obvious that he was extremely wise and cared a lot for Karou. I really hope that he features more in future books! Laini Taylor did a fantastic job of creating a unique world and mythology to go with it for Daughter of Smoke and Bone. This is the first book I've read featuring chimera where the chimera actually seemed human instead of monstrous. The world of the angels and chimera wasn't perfect and I do have some questions about it, but it did have the right amount of gloom to feel kind of hopeless in a way that seemed to fit with the story. The plot was definitely unique, as was the narrative style. I'm not sure how much I actually loved the way the story was told, kind of jumping from present to past and back, although I did appreciate the backstory that provided. I thought the way the wishes worked and even the wish currency was really interesting and creative too! What I guess was the "twist" became really easy to predict by the time it was actually revealed, but I'm not sure that it was supposed to be all that shocking anyway. 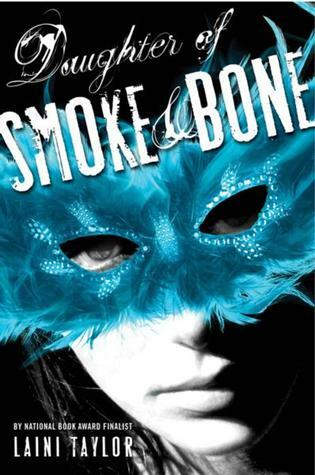 I really enjoyed Daughter of Smoke and Bone, although it did have its issues. The narrative style got kind of annoying towards the end when I just wanted to find out what happened next and the insta-love was something I really wish could have been avoided. Even with the problems I had with this story, it was really unique and I definitely plan to continue the series to see what happens next. I thought Khristine Hvam was an amazing narrator! The accents she had to put on for some of the characters in this book could have so easily gone wrong, but she made the work for both the male and female characters. She is definitely going on my list of top voice actors!